Although similar in many respects to the 1800 model, the 2200 stove is more suited to more intensive, continuous use. 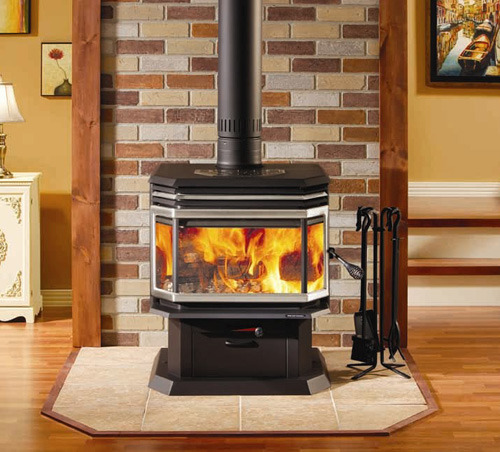 Its 20% larger firebox is designed to maintain steady heat over a longer period. A powerful, ultra-silent 130 CFM fan is available as an option. The glass surface of the bay window is also 20% larger than that of the 1800 model, providing a wonderful view of the fire from every angle. In short, the Osburn 2200 offers a perfect combination of utility and enjoyment! Model Number: OB02211 70,000 BTU/h. Heating capacity: 500 to 2,000 sq.ft. Firebox volume: 2,2 cu.ft. Maximum log length: 18″ Adjustable handle Self-cleaning glass system Ash drawer with safety lid Mobile home approved Optimum efficiency : 76% Qualifies for the USA tax credit (USA only) Tested by Warnock as per applicable standards (CSA/UL/ULC and/or others.